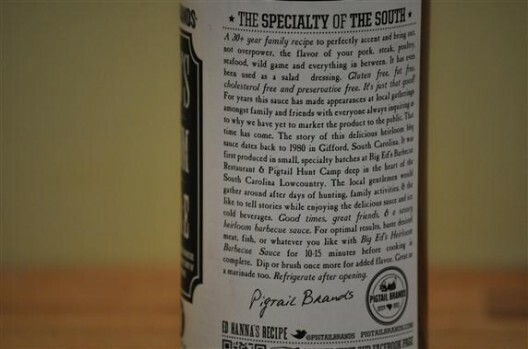 It’s an Eastern N.Carolina sauce made in South Carolina with a story – I love that. When Big Ed, a long-time realtor in Allendale, SC, felt the strain of the recession, the family convened and decided to try to turn a little profit from something they knew and loved, and knew others would love to have at their tables. It quickly became available in five grocery stores in Allendale and Charleston SC and now they hope to gain additional visibility across the country. 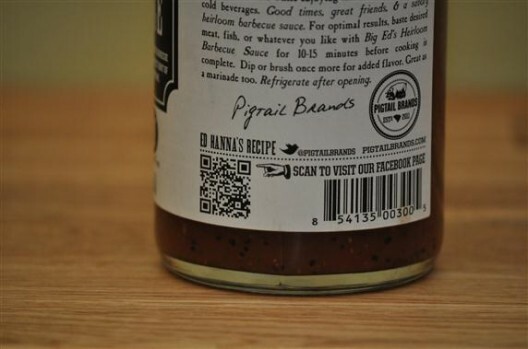 The story of this delicious heirloom bbq sauce dates back to 1980 in Gifford, South Carolina. 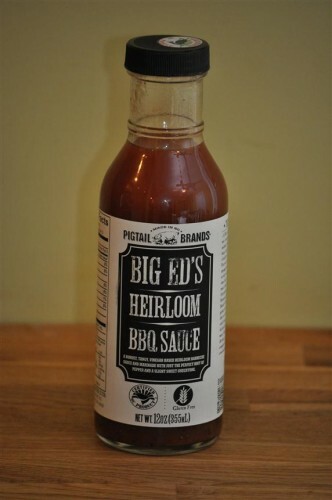 It was first produced in small, specialty batches at Big Ed’s Barbecue Restaurant & Pigtail Hunt Camp deep in the heart of the South Carolina Lowcountry. The local gentlemen would gather around after days of hunting, family activities, & the like to tell stories while enjoying the delicious sauce and ice cold beverages. Good times, great friends & a savory heirloom barbecue sauce. Today, Matthew Dukes Hanna, The Sauce Boss and son of Ed at Pigtail Brands, produces the sauce in batches with help from the entire family including his mom, dad, brother and sis. I’m not a designer, but I can certainly appreciate a well-designed bottle of sauce. This 12 oz glass bottle welcomes you with a classic, vintage / country-western look and feel. The black and white label is cool and provides a great contrast against the rust colored contents. The copywriting is confident but doesn’t overpromise. It’s getting off to a good start in my mind. What’s inside is a thin (i.e. watery) Eastern North Carolina style sauce (albeit from South Carolina) that’s heavy on the apple-cider vinegary tang and black pepper. For me personally, I’m not a huge fan of the thin vinegary peppery sauces but after trying about 30 of em, I think I can say this is one of the better ones I’ve tried. 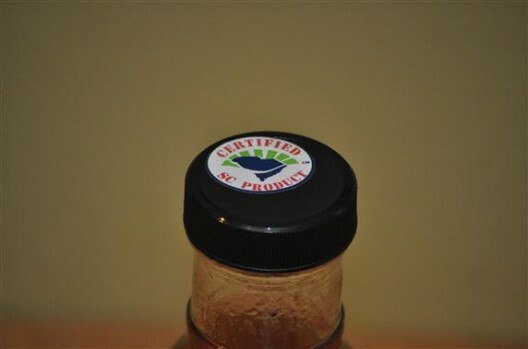 This thin kind of sauce (sometimes called a mop sauce) is best suited for pulled pork or potentially pulled chicken or other kinds of meat products that are left to bathe in a pool of liquid. 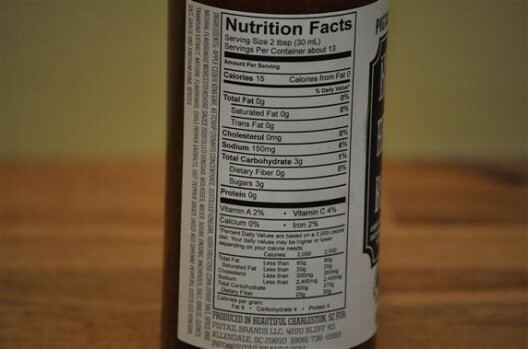 Doesn’t work well on classic backyard BBQ chicken or BBQ burgers – although with some basting and marination creativity, I’m sure there’s a way you can get this sauce to work in the classic backyard set. It just takes a little more effort than a thicker sauce. It’s Gluten-free, Preservative-free, includes Worcestershire, and a ketchup with HFCS. For folks who love “classic NC style sauce” meaning a thin vinegary/peppery “sauce” you’ll love this. But if you are a fan of sauces like Sweet Baby Ray’s and Stubbs and KC Masterpiece– then this is NOT the sauce for you. Nice review ! I really love the visual identity, that’s pro and clean and I’d love to test it !